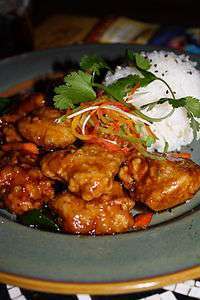 Bourbon chicken is a dish named after Bourbon Street in New Orleans, Louisiana and for the bourbon whiskey ingredient. The dish is commonly found at Cajun-themed Chinese restaurants. The recipe includes soy sauce, brown sugar, ginger, and bourbon whiskey in the base, and the chicken is marinated in this sauce.